Winthrop Bell, authored a book, The "Foreign Protestants" and the Settlement of Nova Scotia, in 1961, as a result of his intensive research into the early settlement of Halifax. Nova Scotia. Thanks to Bells work, we have been able to locate the parents of Catherine Hirtle (or Hartell) who married our John Casper Jost, son of George and Susanna. Catherine's grandparents, Georg Herttel (as he spelled it) and Maria Barbara Elisabetha Engelhorn were from the small town of Leimen, near the well-known city of Heidelburg. After Georg died, Maria remarried to Johann Michael Schmitt. In 1752 they, with several of their children, embarked on the "Gale," a ship of emigrants bound for Nova Scotia. According to Winthrop Bell, author of the book, The "Foreign Protestants" and the Settlement of Nova Scotia, "The Schmitt family Bible had originally been the Bible of Georg Herttel." "Johann Michael Schmitt [who married Georg Herttels widow] not only recorded births, marriages, and deaths, but also, in the blank pages provided in the volume, wrote some memoranda about Noteworthy Occurrences. . . . . In 1954 [the Bible] was located, and ultimately obtained by a descendant of Johann Michael Schmitt, and its manuscript records made available again to students of Nova Scotia history by its present owner." Bell goes on to say that the owner, Mr. Kenneth Burgess of Chicago presented a set of photostatic copies to Mr. Bell, and to the Provincial Archives of Nova Scotia [PANS] in Halifax. In 1956 Mr. Burgess issued a translation in a privately printed book, Colonists of New England and Nova Scotia--Burgess and Heckman Families. Bell used the information in the Bible to make notes on the family, and quoted from it several times in the writing of his book. For a transcript of the "diary", please see Nancy Shaver's website in the Links section of this page. Johann Jacob Englehorn, of Hockenheim, married Elisabetha. born June 8, 1708; died Dec. 6, 1783; 74 years old. She was buried at LeHave, NS. Married Georg Herttel. host of the "Star, " an inn at Old Lossheim. died April 12, 1759, in Mannheim, Germany. Married Stumpf, the head of the pheasant keeper at Sandhausen. Georg Herttel, born June 1, 1687; died Sept. 3, 1736, in Germany; 59 years old. Married (Nov. 24, 1713) Christina Sophia, died May 15, 1727. In Johann Michael Schmitts family Bible, he was said to have been the "blacksmith of the hunting outfit of the Elector Palatine at Bruchhausen". He was buried in Leimen. Second marriage (July 22, 1727) Maria Barbara Elisabetha Engelhorn, born June 8, 1709; died Dec. 6, 1783, in Nova Scotia; 74 years old. Her parents were of Hockenheim. She had not been married previously. After Georgs death, Maria remarried (in Germany) Johann Michael Schmitt, born March 7, 1714; died June 9, 1798; 84 years old. When Johann Michael Schmitt brought his family to Nova Scotia, Marias children accompanied them. 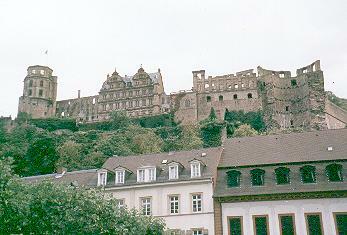 The family came from Leimen, a village in Baden, Germany, four or five miles south of Heidelberg. They arrived in Halifax on board the Gale, in 1752. Our ancestor Johann Martin Hirtle was 18 years of age at the time. In the family Bible was written of Maria Barbara Elisabetha Englehorn Hirtle Schmitt at the time of her death: "Through her six children she had 61 grandchildren, of all of whom . . . 57 remain yet alive as long as God wills it." born Jan. 15, 1715; died Oct. 22, 1717; two years old. born April 9, 1720; died March 11, 1723; not yet three years old. born Jan. 6, 1722, on the festival of Epiphany. born Dec. 14, 1723; died Dec. 17, 1723; three days old. born Jan. 18, 1725; died immediately. born Feb. 10, 1729; died Feb. 20, 1803; 74 years old. Married (?). There was a Susanna Elizabeth Hirtle who married George Fancy in Lunenburg, but it is believed to have been another girl, the daughter of Hans Michael Hirtle, of Hochdorf, Germany. 29, 1731; died Jan. 31, 1733; not yet two years old. Martin," born June 8, 1733; died Sept. 1, 1776, in Halifax, NS; 43 years old. Married Mary Smith. They had 10 children.
. 30, 1736; Oct. 30, 1801; 64 years old. Married (Jan. 20, 1753) Johann Christian Ernst. born March 1, 1739; died July 2, 1739; four months old. born April 13, 1740; died Nov. 27, 1780 ("just as there was the great eclipse here", acc. to her fathers diary); 40 years old. It is not clear whether she is the Catherine Smith who married (June 8, 1759, in Lunenburg) Peter Zwicker. The family Bible seems to indicate that she died unmarried, in her fathers home. born March 17, 1744; died May 7, 1744; not yet two months old. "Elizabeth," born June 24, 1745. Married (June 26, 1768, in Lunenburg) Caspar Heckman, Jr.
"Thomas," born Oct. 15, 1747. Also called Johann Thomas--Hans was sometimes a nickname for Johann or Johannes. Married (March 20, 1770, in Lunenburg) Christina Catherine Wirthin (or Werth), daughter of Jacob Werth. born July 13, 1750; died at the age of 1 1/2 years. Johann Martin Hirtle, "Martin," born June 8, 1733, in Leimen, Germany; died Sept. 1, 1776, in Halifax, NS; 43 years old. Married (Aug. 15, 1758, in Halifax) Margaret Kurtz (or Curtis), died sometime after the birth of her son in 1762. After her death, he married (Feb. 10, 1763, in Halifax) Mary Dorothy Smith. (See her family below.) The record of his death in the family bible tells that he had ten children--although we only have record of five of them. Bell commented that on the indebtedness list for the ship, Martin "wrote an excellent signature," indicating that he was literate. bapt. Sept. 28, 1760, in Halifax. bapt. Aug. 1762, in Halifax. His mother may have died in childbirth, or soon after. bapt. Dec. 26, 1764, in Halifax. bapt. April 24, 1768, in Halifax. born Aug. 5, 1770, in Halifax (bapt. Aug. 26, 1770); died March 14, 1846, in Guysborough; 75 years old. Married (March 29, 1791, in Halifax) John Casper Jost. Mary Cartherine Hirtle (also written as Hartell), "Catherine," born Aug. 5, 1770, in Halifax; died March 14, 1846, in Halifax, NS; 75 years old. Married (March 29, 1791, in Halifax) John Casper Jost, "Casper," born Sept. 11, 1763, in Halifax; died June 12, 1850, in Halifax, NS; 87 years old. Casper was a shoemaker by trade--there were no shoe factories in those days. Both were buried in the Camp Hill Cemetery in Halifax. Johann Adam Schmidt, married Cathrina. Johann Adam and Cathrina came on the Ann in 1750. The list doesnt give his age or occupation. According to the passenger list (with interpretation by Bell) they were from Westernach, then in the Hohenlohe principality. Westernach is now a small village in Baden-Württemberg, about 40 miles northeast of Stuttgart. It is just north of Schwäbisch Hall and south of Kupferzell. A well-to-do gentleman by the name of Kluge paid passage for a group of the immigrants on board the Ann, with the intention that they should work off their passage working for him for a time in Nova Scotia. However, Mr. Kluge died just three days after their arrival in Halifax, leaving the families without debt. Johann Adam Schmidt and his family were one of these. Ships list mentions "Johann Adam Schmidt, his wife, and three sons." No mention is made of the younger members of the family until the List of Settlers, in July 1752, "Adam Schmidt, his family consisting of 3 males and 1 female above the age of 16, and 1 male and 2 females under 16." Bell feels that the two daughters may have come on a later ship, and may not have been daughters, but some other relation. It could be that they were among the orphaned children that arrived, and may have been adopted by this family [my idea, not suggested by Bell]. My theory is that they were actually on the Ann with the rest of the family, but were under the age of 14 at the time, and not considered full-fares, and so were not mentioned with the rest. Children 14 and under were only half-fare, and under 4 were free. Since Mr. Kluge paid their passage, they may not have felt it necessary to mention the half-fares, as they would have had the British government been extending them credit for passage. No mention is ever found of the three older sons in the later records, save a burial record for a John Schmidt, who may have been one of them. The other two may have joined the local military garrison, as several arriving immigrants did who never showed up in later records. born before 1736, in Germany; died Jan. 28, 1751, in Halifax. born before 1736, in Germany. Disappeared from records before the victualling lists began, possibly joined the local military unit. born after 1736. Confirmed Oct. 4, 1761, in the Little Dutch Church, in Halifax. born after 1736, probably ca. 1740. Confirmed Oct. 4, 1761, in the Little Dutch Church, in Halifax. Married (Feb. 10, 1763, in Halifax) Johann Martin Hirtle, "Martin," born June 8, 1733, in Leimen, Germany; died Sept. 1, 1776, in Halifax, NS; 43 years old. born after 1736, probably ca. 1744. Confirmed Oct. 4, 1761, in the Little Dutch Church, in Halifax. Married (May 23, 1763, in Halifax) Casper Haun, half-brother of Susanna Catherina Morash Jost. The "Foreign Protestants" and the Settlement of Nova Scotia, by Winthrop P. Bell, 1961. The Lord is righteous in all His ways, and kind in all His deeds! The Lord is near to all who call on Him, to all who call on Him in truth!